It’s the coming of the new age of war, Castle Raid 2 – New alliances is here. Are you prepared to do battle? Castle Raid is back, bigger and more challenging than ever before! In this unique tug-of-war you once again fight to defend your castle against the enemy’s hoard. Get ready to enter the magical world of noble knights and sage wizards, dragons and assassins, and set out on a new epic adventure. Fight your way through the snow covered lands of the Frozen Plains and the beautiful open fields of the Greenlands. Learn the ways of your new enemy, the Reavers – You’ll be seeing a lot of them. Castle Raid 2 features tons of new exhilarating content guaranteed to knock your socks off. Play against your friend on the same device or take on the challenge of completing the game in campaign mode. With 20 new battlefields, three difficulty modes, gladiator and time challenges, 9 unit classes to choose from and upgrade, you’ll be sure to have a great time! – Unique single device multiplayer – Fight your best friends to see who’s the boss! – Fight your way through 20 battlegrounds, in two different worlds. 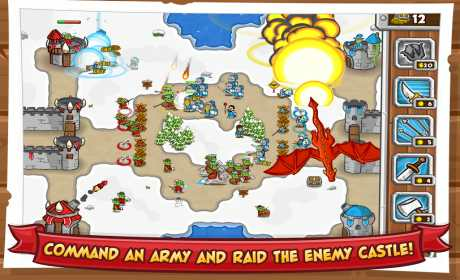 With delightful new obstacles such as dangerous spike traps and thorny defense barricades, arrow firing fortified turrets and strategically placed guard zones. Oh, and did we mention the dragon? We have a dragon. 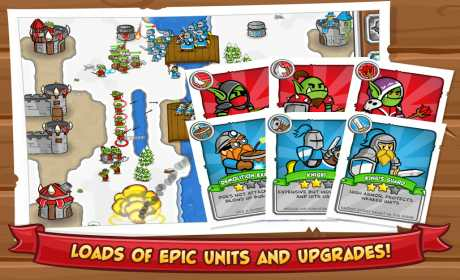 – Choose from 9 different units when setting your battle formation. Meet the evil Warlock, the sneaky Rogue, the King’s Guard, the cunning Wizard and the reckless Demolition Expert. – Find out who the Reavers are and why they talk so funny (hint: they make up for their speech impediment with brute force). – Can you outsmart the computer opponent in Casual, Normal or Heroic difficulty? He’s got like… loads of RAM, so good luck with that. 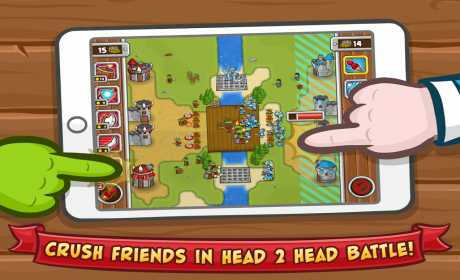 – Intuitive gameplay, pick up and do battle – Castle Raid style! – Story based campaign mode with beautifully illustrated graphics. – Have you beaten the computer opponent in campaign mode and think the game is over? Think again. To really beat the game you have to complete all challenges: Time challenge – beat the level within a specific time. Gladiator challenge – beat the level with a predefined unit setup (trim your fingernails for this one!). – Stunning retina graphics and beautiful animations. – Use our global leaderboards and over 40 achievements to compete with people all over the world.